In a pot, steam cauliflower until tender. Add steamed cauliflower, butter and sauerkraut to a food processor, mix until mashed. Salt and pepper to taste. Heat a large skillet over medium heat and sear the sausages on each side. Add water to cover sausage 1/2-3/4 of the way. Cook uncovered until water has cooked off and the sausages are cooked all the way through. Move sausages to a plate. Add oil, onions and peppers to the pan and cook until onions are translucent, scraping up the brown bits from the sausages. Add almond flour, stir and continue cooking 4-5 minutes. Add stock and balsamic vinegar, stir. Add sausages, and drippings, to pan with pepper and onions. 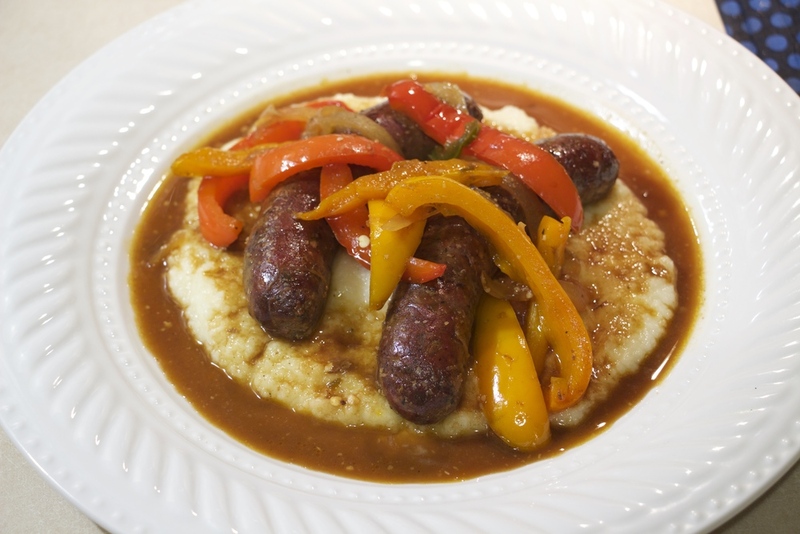 Serve sausages, onions and peppers over mashed cauliflower. Top with sauce. Note: If cauliflower isn't your thing, this recipe also works great with mashed potatoes.